Looking for a place to park with a car can prove difficult on the relatively small island of Key West. There are only so many parking spaces available in this popular tourist town, so why not beat the congestion of traffic by renting one of our state-of-the-art scooters. You can avoid the trouble of hunting for a parking spot, as well as the busy traffic areas by renting one of these fun and fuel-efficient vehicles. These quick little rides can also easily maneuver through some of the tighter back alleys and narrow streets, allowing riders to bypass traffic jams. These eco-friendly and relatively quiet vehicles offer vacationers the perfect method of transportation around the island. We provide renters with one-seater, two-seater, and two-seater deluxe options. Two seat scooters are great for couples who want to explore the quaint back streets and coastal roadways together. You have the option of renting one of our scooters on a daily or weekly rate. 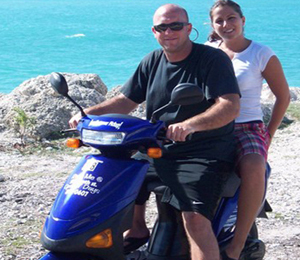 If you are staying in Key West for a week vacation, be advised that once you motor around the pleasant island of Key West on one of our scooters for a day, you will want to keep it for the whole week. Even if you only use the scooter for four days out of the week, you will save money by selecting the weekly option. The weekly rental option also offers you access to the scooter at your convenience, as opposed to the daily rate which includes five hours of scooter riding. If you have never driven a scooter before, that is no problem. Our friendly staff will be happy to give you a few lessons to make sure you can properly and safely operate a scooter. All you need is a normal drivers license. Q: Where is the pickup location for this rental? Check-in instructions will be included in your confirmation email. Q: Do you provide a pickup service? Yes, complimentary pick-up is provided from any where in Key West. Your confirmation email will contain a local phone number to coordinate your pickup. Q: What is the minimum age requirement to be a passenger on the scooter? All passengers must be able to reach the foot holders with their feet - usually passengers have to be at least 4 feet tall. Q: What is the minimum age to drive a scooter? You must be at least 18 or older to drive a scooter. Q: What is the difference between the 2-seater and the 2-seater deluxe? The 2-seater deluxe is slightly larger and faster. Scooters must stay in the general Key West area. A Credit Card will be required for security purposes during your rental. I have been to the Bahamas many times, but 2 Seater Scooter is one of my favorite trips! It includes everything that everyone should do here. As a Bahamas veteran, I can say only the best about this experience!